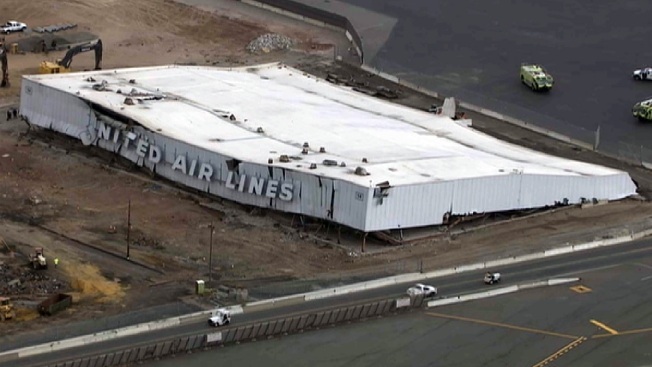 Four workers were hurt when an old cargo hangar collapsed at Newark Liberty International Airport Wednesday afternoon, authorities said. The hangar, which was being prepared for demolition, collapsed at about 2 p.m., authorities said. Port Authority of New York and New Jersey spokesman Joe Pentangelo said two of the four injured workers were seriously hurt, but they are expected to survive. The other two suffered minor injuries. All four were transported to a nearby hospital. Nine workers were inside the building at the time and all are accounted for, Pentangelo said. Chopper 4 footage from the scene showed several emergency crews around the damaged United Airlines hangar. Several people were seen in stretchers, though it appeared as if they are conscious. There were no aircraft in the hangar when it collapsed. Engineers are inspecting the location. The building is no longer owned by United Airlines; it was acquired by the Port Authority in 2005 for storage use. Recently, the Port Authority approved the hangar and two others for demolition.